With a shock of gray hair, oversized glasses and a messianic zeal for the future, Bre Pettis looks more like the host of a sci-fi movie channel than chief executive officer of a small manufacturing company in a gritty Brooklyn neighborhood of bricks and brownstone. But Pettis, a 38-year-old former Seattle art teacher, is a man on a mission to put his company's manufacturing kits on every desktop so users can build their own 3-D printers to create colorful plastic models of objects that they design or download from the web. "I'll be on the subway, and people will ask me what it is, and I'll tell them it's a teleporter [from Star Trek], and they'll believe me," says Pettis, co-founder of MakerBot Industries, LLC, a Brooklyn company that makes open-source kits for 3-D printers. "The trouble is that, when I tell people it's a 3-D printer, they look at me the same way. We still have a lot of education to do." 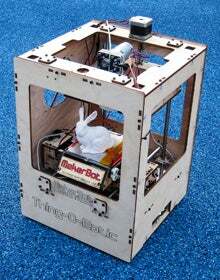 A 3-D printer is a machine that can turn a three-dimensional computer model into a physical object. The printer identifies cross-sectional slices of the image and then lays down slice upon slice of plastic material to create a physical prototype. Engineers, architects and a range of other professionals, as well as hobbyists, use them to make models of their designs. Launched in January 2009, Pettis's company has used blogging, social media and word-of-mouth to develop a cult following among geeks and do-it-yourselfers around the world. It puts its blueprints for the kit on the web for anyone to share, tweak or copy. With manufacturing kits that retail for less than $1,000 a pop, MakerBot's nearly 3,000 initial orders have generated enough revenue to cover the company's overhead, pay its 22 employees' salaries, and turn a small profit for Pettis and his two co-founders, Zach Hoeken Smith and Adam Mayer. "Having a company be profitable in 42 days is stupid," says Pettis with his characteristic humor. He has been surprised by his company's rapid profitability. "We've just been able to strike a chord with a certain niche of [early adopter] consumers." While such growth may be impressive for a company built on $75,000 in friends-and-family money, it's a drop in the bucket compared to the $1 billion-a-year market for 3-D printers and scanners used by large corporations. 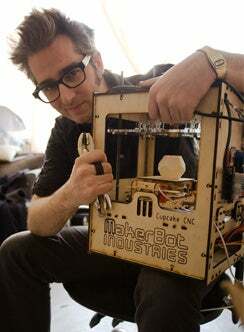 In an interview, Pettis shared his vision for MakerBot. Edited excerpts follow. Q: How were you able to create such buzz around your product? A: We have a long-term habit of sharing everything we've learned with the Internet. The friends you make and the reputation you build from your work can really bootstrap the process of getting the word out. Q: How did MakerBot develop its cult following and round up the first early adopters? A: We drink a lot of caffeine, work long days and always strive for improvement. Also, we have fun. We expected to sell 10 MakerBots a month when we started and so we made 20 kits and figured we would sell 10 and have 10 on the shelves for the second month of sales. We launched the MakerBot and blogged about it, told everyone we knew and within a few days, we'd sold all 20. That's when I started camping out in front of the laser cutter for weeks on end [to build more]. Q: The 3-D printer has been around in corporations and manufacturing for a long time. Are people going to be buying MakerBots the same way they buy iPods? A: We're in this wonderful time that's really similar to the dawn of the personal computer. [Back in the day,] nobody thought there needed to be more than 10 computers in the world. You and I both have computers more powerful than that in our pockets. When the Apple 1 came out, it was a kit. It was a circuit board and you had to add your own keyword, monitor and case. A lot of big companies got started with this DIY kind of mentality. Q: How big do you think this could potentially get? A: Right now, people who buy [our machines] are tinkering moms and dads, teachers, students -- engineering students, in particular. We've shipped 30 to addresses at the Massachusetts Institute of Technology alone. Most people we sell to are ready to live in the future, who want to own the means of production and feel empowered to make things themselves.